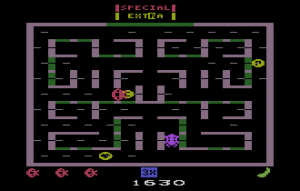 Lady Bug and A-VCS-tec Challenge now available for the Atari 2600 VCS! Lady Bug screenshot: for the Atari 2600 VCSThanks to our friends at AtariAge, two new homebrew games for the Atari 2600 Video Computer System (VCS) are now widely available. While "A-VCS-tec Challenge" has been made previously available in a limited run (my original blog about it here) - though sourced from Europe - this is the first time I'm aware that this new, original arcade conversion of "Lady Bug" is available for sale.